Pride of place amongst the Civic Regalia of Gravesham are a silver Mace and Oar. 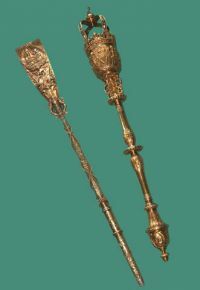 The mace was made in 1709, and the oar in 1892. Both are heavily decorated with reminders of the Borough's close associations with the river Thames. For example, on the back of the Oar, there are the coats of arms of the Watermen and River Pilots. In the middle there is a typical river scene from the 1890s depicting a large ocean-going steamer, a merchantman and a steam tug with barge and rowing boat. The two figures on the front of the Oar represent trade and industry, and are sitting on a shell pulled by dolphins and driven by old Father Thames. At the base of the blade is the Coat of Arms of Mayor Arnold who donated the oar in his second term of office, and between the notches are the Coat of Arms of Kent, the White Horse and the flora insignia of Great Britain and Ireland. There are also bunches of hops which remind us of Gravesend's proximity to Kent's hop growing district. The Mace has an orb and cross on top of the crown symbolising that Christianity rules the world, and that the Mayor represents the Monarch. The coat of arms on the top of the bowl is of Queen Anne. The harp, fleur de Lis, rose and thistle decorations around the bowl represent Great Britain. Just above the acorn at the base, the Mace has been inscribed with the Coat of Arms of the Portreves of the Borough, who were town leaders before the first Mayor was installed in 1635. The oar weighs approximately 5lb (2.2kg) and is carried in front of the mace on all civic and ceremonial occasions, usually by a member of the Sea Cadets. 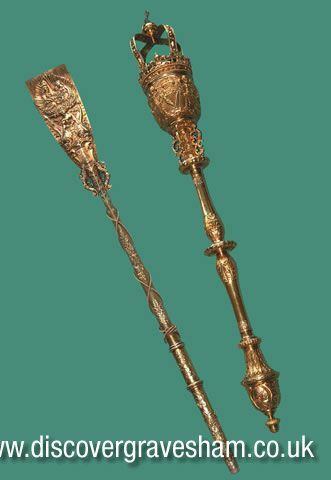 The Mace weighs 15lb (6.8kg) and is very similar in design to the mace used in the House of Commons, and is thought to have been made by the same silversmith. "Discover - Facts on Gravesend - The Mayor's Mace and Oar." Leaflet available from Towncentric.